Extensive analysis of the Copenhagen talks has been put forth by pundits across the political spectrum. In many ways, the scientific bottom line is the most important story here, and it's a story that few are telling. Which is why we're so grateful to the scientists and statisticians and Climate Interactive, who have presented us with these stark figures about the proposals on the table. Here's the scoreboard right now. Tuvalu has refused to sign a climate change deal brokered by the United States, India, China and South Africa. The deal is not legally binding and falls short of the demands of Pacific countries who say science indicates global temperatures need to limited to 1.5 degrees above pre-industrial times to ensure their survival. 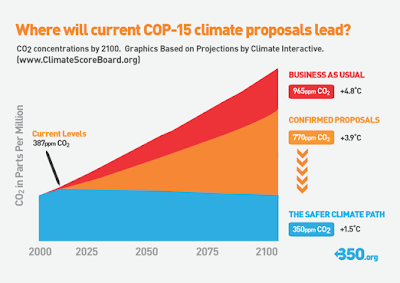 Instead the deal offers a 2 degree target on temperatures, and promises only that the commitments countries make to cut greenhouse gas emissions will be scrutinised. Ahead of a vote on the deal, Tuvalu’s chief negotiator Ian Fry said his country could not accept it. He gave this response to a promise included in the agreement of 100 billion US dollars a year to help developing nations from 2020. Ian Fry says claims by the United States that a deal had been reached, were disrespectful when other countries had not been able to consider it.